TAIPEI, Taiwan--(BUSINESS WIRE)--Extech Electronic Co. (EEC) today announces the worldwide release of the EPV-500 series, the world’s first four-in-one photovoltaic (PV) module safety analyzer. 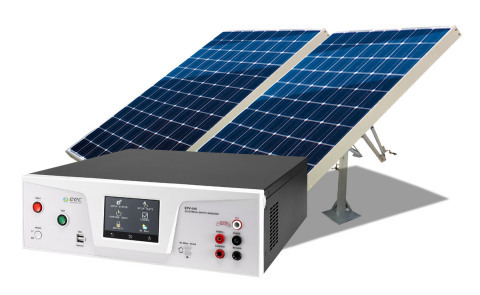 The EPV-500 offers a complete one-step automatic testing solution to perform DC withstand, DC ground bond, insulation resistance, and potential induced degradation(PID) together in a single unit, delivering superior efficiency, performance, and reliability for testing PV panels in both laboratories and manufacturing environments. Keeping pace with the current market trend in solar panel system voltage arrays that deliver up to 1,500 Vdc, the EPV-500 series can perform Hipot tests outputting at 8,000 Vdc to meet the required safety regulations for large voltage arrays. Designed with maximum negative 2,000 Vdc output voltage meeting the PID testing regulation, and further ensures user’s safety when only leaving the power terminal electrically charged. The EPV-500 series provides multiple connection interfaces for expandability and compatibility with existing systems, including PLC, USB, RS-232, GPIB, and Ethernet, allowing remote management of operations via a central computer. One of the major factors contributing to manufacturing efficiency is user operating fluency. The EPV-500 series provides a 4.3” color touchscreen and with intuitive system interface that allows users to take full control. The ample system memory permits storage of up to 2,000 sets of testing conditions, an outstanding feature for saving and recalling data during laboratory or production management. Additionally, the strict account management feature sets multiple levels of user authority for secure and straightforward operations. Extech Electronic Co. (EEC) Introduces the EPV-500 series, the world’s first four-in-one photovoltaic (PV) module safety analyzer.